The anterior, medial, posterior, and lateral talocalcaneal ligaments and portion of the interosseous talocalcaneal ligament are components of the cervical ligament. 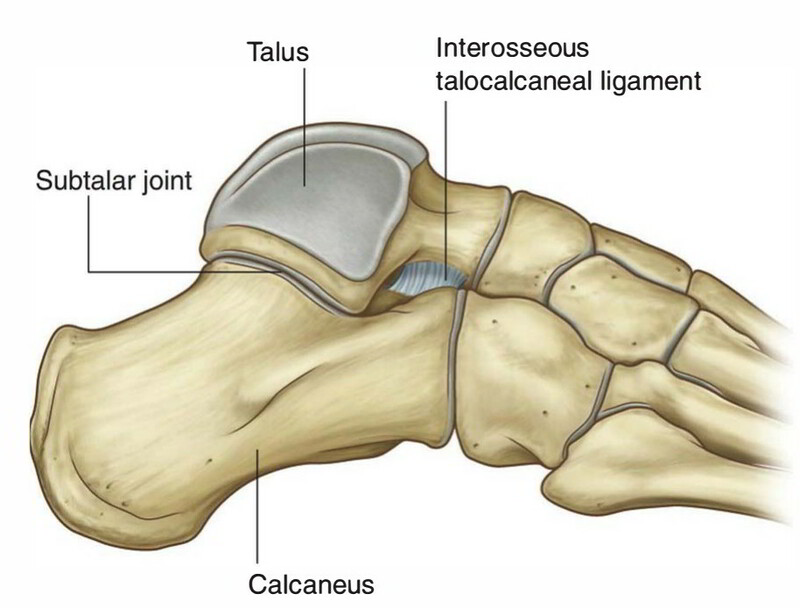 The interosseous talocalcaneal ligament (ligament of the tarsal canal) originates from the sulcus of the calcaneus at the anterior boundary of the posterior talocalcaneal joint and connects the medial underside of the sustentaculum tali. It is a broad, flat, oblique, and medially oriented band. The lateral talocalcaneal liga ment emerges from the inferior surface of the lateral talar process. The lateral talocalcaneal ligament follows a parallel path with the calcaneofibular ligament, connects to the lateral and posterior side of the calcaneus. It is generally just anterior and slightly medial to the insertion of the calcaneofibular ligament. Posterior talocalcaneal ligament emerges from the lateral surface and tip of the posterolateral talar tubercle and inserts on the superior and medial aspect of the os calcis. The posterior talocalcaneal ligament is a small, flat, quadrilateral ligament directed downward and sideways. It may also offer insertion to the fibrous roof of the flexor hallucis longus tunnel. At the talar origin, the posterior talocalcaneal ligament may swap fi-bers with the posterior talofibular ligament. Sometimes the posterior talocalcaneal ligament is formed by two fascicles. The lateral band, extends downward and medially, and inserts on the dorsum of the os calcis, while emerges from the posterolateral tubercle. The medial band emerges from the posteromedial talar tubercle, enters on the superomedial aspect of the os calcis next to the insertion of the lateral band, and extends downward and laterally. A “V” shape formation is formed by two fascicles with a calcaneal apex and talar base. The posterior talocalcaneal ligament initiates from os trigonnium and forms a trigonocalcaneal ligament, when an os trigonum exists. Medial talocalcaneal courses anteriorly and inferiorly, and inserts on the posterior border of the sustentaculum tali and it originates from the talar posteromedial tubercle. The medial talocalcaneal ligament is a short and strong ligament. It limits posteroinferiorly the medial opening of the tarsal canal. A second band originating from the same site but directed downward and posteriorly may be present. This band completes the groove lodging the flexor hallucis tendon and inserts posterior to the sustentaculum tali.